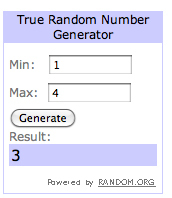 f The Bugbytes: Surprise Winner! (minus mine) and put them in Random.org. That's so sweet of you to do this! Giving is so fulfilling and fun for both participants. Well what a fun surprise! Thanks, TR! :) I'll get it out this week. Congrats to Nadia. Aren't surprises lovely?